To celebrate our final show of the year, we will be giving away a pair of tickets to the NEC Classic Motor Show via our Facebook page. It is less than two weeks until our final car show of the year. The Lancaster Insurance NEC Classic Motor Show is one of the largest and busiest motor shows of the year, covering over one million square feet and somewhere in the region of 72,000 motoring enthusiasts attend this amazing event. We are always really excited for the NEC show as it’s a place where we have been exhibiting for years, and as always will be in the same spot in hall one on stand 147. We will have a range of covers on display, including our Custom Made Indoor, Super Soft Stretch Indoor and our Ultimate Outdoor covers. We will also have some of our Accessories on display and for sale on the stand too. We can’t wait to see you all there! This year, we have decided to give away a pair of tickets via a Facebook competition. This will give you and a friend entry to the show on Sunday 11th November. Take a look at the details of the competition below. 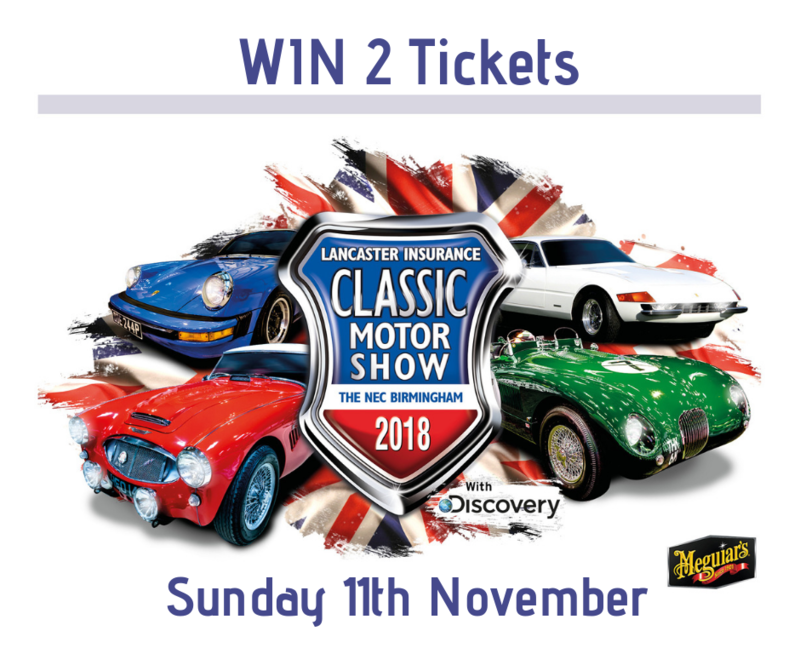 Do you fancy winning two tickets to attend the Classic Motor Show at the NEC Birmingham on Sunday 11th November? It is the biggest and best Classic Car Show in the UK! More than 3,000 iconic classic & vintage cars plus motorbikes will be showcased this year! Celebrate ‘the best of the best’ from the UK classic car club scene with the grand final of the Meguiar's Club Showcase. Not only will you find an unrivalled collection of vintage vehicles, you can also visit the UK's biggest indoor Autojumble - a haven of car parts and spares for anyone working on their vehicle, as well as 500 specialist automotive exhibitors and traders offering a mix of products and services. We will be there on stand 1-147 so come and see us! The prize winner will be selected at random on Monday 5th November and notified by private message to arrange delivery. By entering a competition on the Classic Additions Facebook page, you are agreeing to Classic Additions storing and using your information for marketing purposes. We will not share your information with third parties. Entrants are providing information to Classic Additions and not to Facebook. Entries must be submitted by 5th November, by no later than 5.00pm. 2. Entries must be posted on Facebook. Facebook entries must like and share the Classic Additions page and tag in one person. Entrants who do not do all three elements will not qualify for entry. 4. The winner will be randomly selected on Monday 5th November. Classic Additions reserves the right to amend the competition end date at any time. 5. If you win a competition, we will notify you by Direct Message on Facebook. If we cannot contact you or you do not respond prior to Thursday 8th November, we reserve the right to offer the prize to another competition entrant. 7. No prize or part of a prize is exchangeable for cash or services. 10. Classic Additions reserves the right to amend these rules at any time. We may also create rules which will apply to a specific competition only. If we do this we will publish the amended competition rules and/or specific competition rules on the relevant competition page.